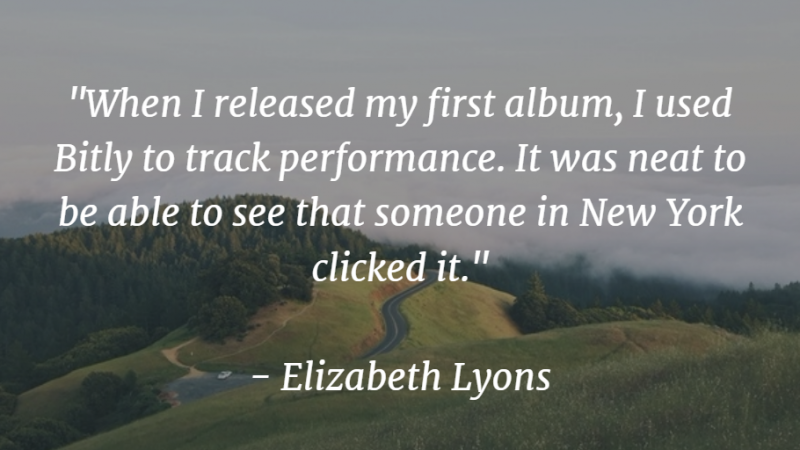 This week, we sat down to chat with independent artist and country singer, Elizabeth Lyons, about her music career and how she’s been using Bitly to track her work. 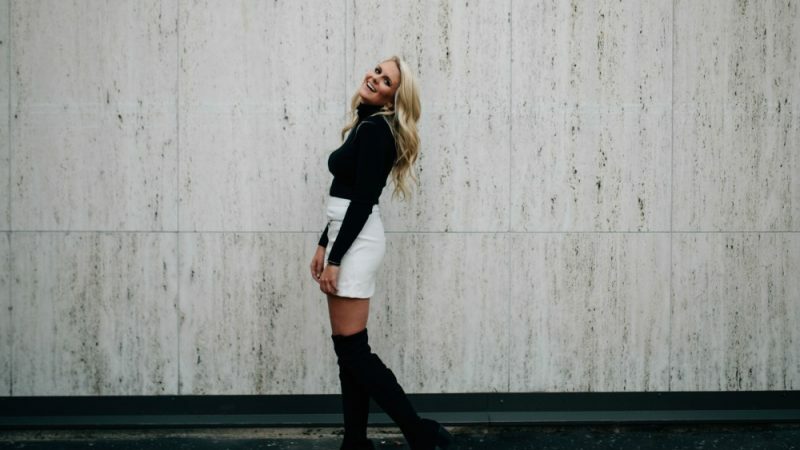 A Chicago native, Elizabeth moved to Nashville a few years ago to finish up her college education at Vanderbilt University and jumpstart her career in music. During her senior year of college, she released her self-titled debut EP, currently an Album All-Time Bestseller Under $8 on iTunes. Elizabeth now runs her own record label and publishing company out of her apartment in Nashville. Tell us a little bit about you and your journey so far. I’ve been doing the music thing my whole life, but I didn’t really start to take it seriously until senior year of college when my first album went up on the charts. Since then, I’ve been running my own record label, Roar Records LLC, and my own publishing company, Elizabeth Lyons Music Publishing, all from my couch and apartment in Nashville. 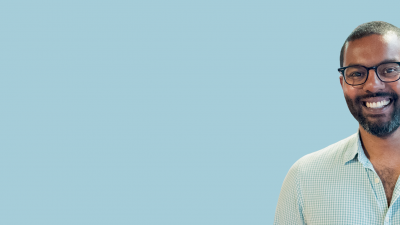 How do you use Bitly as an entrepreneur? I call myself an entrepreneur in addition to a musician. It’s true that I spend a lot of time doing music stuff, like writing my own songs and playing shows, but there’s actually a lot more that goes into booking the shows, the travel, and building marketing campaigns. I talk/write a lot so I use @Bitly often for @Macys @iHeartRadio #RisingStar! Also, anyone who knows me knows that I tend to talk nonstop. This is especially the case online, in my tweets and in my other social posts. My little sister always says “you need to keep it shorter.” My thing is that I want to stay true to who I am offline and online, but you can only use so many characters on Twitter. With Bitly, I’m able to say what I want to say since I can shorten my links and get some characters back. The best thing is that you can also see how many clicks each piece of content is getting. Bitly links are more powerful than regular links, because I know if people are engaged or not. For example, when I released my first album, I used Bitly to track performance. It was neat to be able to see that someone in New York clicked it. Being in the beginning phases of my career, this kind of feedback is extremely valuable. I’m always looking at where my fanbase is when I’m booking my shows. I also look to see which posts are working so I can continue to post similar content. Recently, for Macy’s iHeartRadio Rising Star Top 5 contest, I customized the back half of a Bitly link: bit.ly/elvote. This was great because it added a layer of professionalism – everyone is familiar with Bitly. It also makes it much easier for people to remember the link and pass it on to their friends. For me and my band, customer experience is about making people feel good and building relationships with each fan we meet. Our goal is that, for the 30 minutes or hour that we have with the audience, they can just escape from the world and the reality of life and troubles. 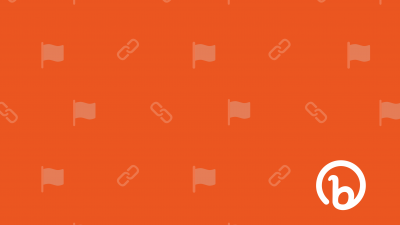 Bitly is all about using the link to bring channels together and ultimately, bring people together. How do you see that in your work? Music is a really powerful thing. I have the ability to make people happy which is amazing. One of the things I often tell my band is that at any given show we play, it’s not about how many people are there. It’s not about how great we played. It’s about how it makes people feel. We have the ability to make people smile and to give them big hugs. More people need love and joy and I’m able to do that. You’ll find that in all of my songs there’s that little piece of hope. A lot of my music is fun and upbeat. I always try to give back in everything I do. I have people who have been supportive from the very beginning. From my teachers growing up, to my family members who encouraged me to follow my dream, to the fans who have come out to watch me play. I also have a band that’s been with me for the past two to three years. I’m lucky to be doing what I love to do and that’s the best thing about it. But I can only do so much on my own – it takes a village to do all of this. What social media channels do you most frequently update? 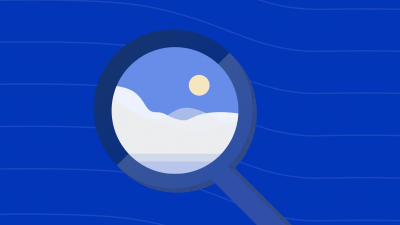 Do you use Bitly across these channels? I use Bitly across YouTube, Twitter, Instagram and Facebook. I even use Bitly links in the YouTube description of my videos, because it is good to keep content consistently branded. I assume a lot of your fans are millennials? How do you think social media/technology has impacted the way you connect with them? I think it’s always important to be true to who you are. On social, I always show a mix of my music but also my life. My family, they’re such a big part of my life. I’m so grateful for them. You’ll see a lot of them as well as my music on my accounts since I like to incorporate both worlds. Recently, with Macy’s iHeartRadio Rising Star Top Five, we did a live streaming event with an app called YouNow. It was so great that fans could tune in to follow along in that moment. I think people want to get to know you as a person, and especially in the music industry, that’s what they buy into. Of course the music has to be good, but that connection and how you make them feel at a meet and greet or during a show is just as important. My favorite part of this journey is seeing and getting to know people and hearing their stories. My fans always become my friends because they get to know me and I get to know them as well. For example, I can see on Twitter that @Islandboy88 is in the Florida Keys this weekend. I can see on Instagram that @ChristiCummings is going to be at my show in 8 hours and then I can thank her afterwards. Memories are the beautiful thing on social. I wouldn’t be able to be an independent artist without social media. How do you think the increasing number of social channels and devices has changed the music industry? It’s been interesting to see how it’s evolved. For instance, Facebook used to be really popular and now it’s more Instagram and Snapchat. iTunes used to be the only thing that really existed now there’s Pandora, Spotify, Apple Music… Whether you’re a consumer or an independent artist, there are more resources than ever to learn from, engage with and produce music on. For those in the entertainment industry – keep an eye on the changing trends, but make sure that in all your social media efforts that your voice and branding stays consistent across each channel. Any advice for aspiring entrepreneurs and musicians? You have to have patience, perseverance and persistence. It takes time to build up your presence. You have to think outside the box and be creative, but also be authentic and say what you feel sometimes. Be in the moment. Live in the moment. What’s your big music dream? I’m living my music dream right now! My band and I have been on the road touring. We recently played Country Jam Colorado, Taste of Country Music Festival, CountryFest, Country Stampede, Jam in the Valley and Summerfest. Opening for artists who I admire and look up to like Kenny Chesney, Jake Owen, Hunter Hayes, Sam Hunt, Frankie Ballard, Eric Paslay, Chase Rice, Old Dominion, and many more. The title track for my new EP ‘I’ve Never’ was recently selected as apart of the very prestigious and exclusive Macy’s iHeartRadio Rising Star Contest. I placed in the Top 3 which was amazing! The fans were so dedicated and truly made this happen. It was an incredible experience working with Macy’s and iHeartRadio, seeing the power they have across the nation. Friends all over the country were hearing my name and my song in Macy’s stores and on iHeartRadio stations. One of my BIG music dreams is to play the Grand Ole Opry. I’ve had the opportunity to go back stage a few times and its SO magical. I get goose pumps and super emotional thinking of my Great Grandpa Al who used to listen to every show and always dreamed of playing on the stage. Another big dream is to win a CMA, ACM Award and Grammy. To keep up-to-date with Elizabeth’s music, touring and other adventures, follow her on Twitter. 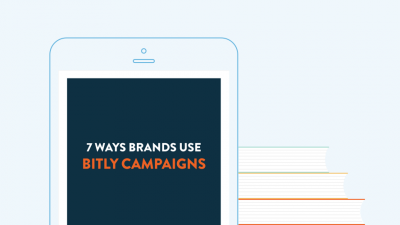 Learn 7 different ways brands are using Bitly Campaigns to manage complex, multi-channel marketing initiatives.